In the Army and Marines, an enlisted job is called MOS or military occupational specialty. In the Navy and Coast Guard, an enlisted job is called a rating. But in the Air Force, a job is referred to by an Air Force Specialty Code, or AFSC. 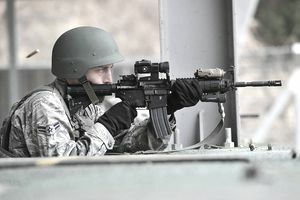 It's a five-digit alphanumeric code for enlisted Air Force personnel, four digits for officers, sometimes modified with additional characters for more precise identification. When it split from the Army in 1947, the Air Force continued to use the MOS system to describe its jobs. This changed in 1993 when it introduced the current system used today in a major restructuring. This allowed the Air Force to streamline its workforce somewhat; the number of enlisted jobs was trimmed from 203 to 176, and officer jobs were reduced from 216 to 123. Here's how the AFSCs break down. The first number in the AFSC is the career group. There are nine Air Force career groups. Operations is Group 1 and includes jobs such as aircrew operations, cyber warfare, intelligence, remotely piloted aircraft (drones), and weather. Maintenance/Logistics is Group 2 and includes aerospace maintenance, logistics, and missile and space systems maintenance. Jobs in Group 3, Support, include cyberspace support, civil engineering, and security forces. The Professional career group, Group 5, includes paralegals and chaplains, while Group 6, Acquisitions, includes contracting and financial management. Special Investigations is Group 7, and Group 8, Special Duty Assignments, is used for specialized jobs like instructors, couriers, and training leaders. Special Reporting Identifiers is a designation for temporary status, such as a trainee, prisoner, or someone in a group that is otherwise temporary. It's career Group 9. The second digit is a letter that identifies the career field. The third digit is a number indicating the career field subdivision, also known as the job functional area. The fourth number in the AFSC indicates a person's skill level. For example, someone with the AFSC "1A051" has a five skill level. An individual receives the "1" (helper) skill-level when they enter technical school for the AFSC. Upon graduation from technical school, they receive the "3" (apprentice) skill level. Airmen are normally awarded the "5" (journeyman) skill level after a period of on-the-job training and correspondence courses, or CDCs. Depending on the job, this process can last anywhere between 12 and 18 months. Upon promotion to Staff Sergeant, individuals enter training for the "7" (craftsman) Skill Level. This level ​of training includes more CDCs, more on-the-job training, and for some jobs, a 7-level technical school. Once promoted to E-8, the person receives a "9" (superintendent) skill level. The final digit (numeral) indicates further job division within the same functional area. Specific skills (such as the type of aircraft) are designated by suffixes, such as "A" or "B."